Copies of the magazines I've received over time. 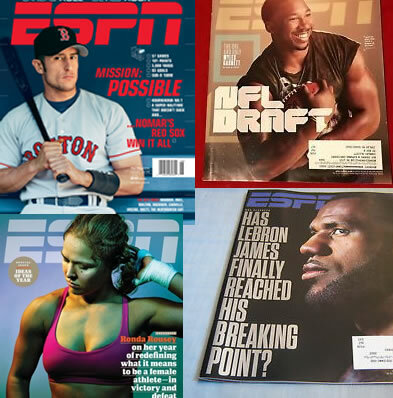 My son and daughter both play sports and enjoy reading ESPN the Magazine. Meanwhile, I use it to get ESPN Insider for free. I've found a way for you to save a lot of money on ESPN Insider. The math is simple; ESPN Insider cost $4.99 per month or $3.33 per month if you pay yearly. This means for one year access you'll pay $59.88 if you pay monthly or $39.96 if you pay for one year in advance. Here's the deal though, if you purchase ESPN the Magazine you get ESPN Insider included for free. But the kicker is ESPN Magazine is on sale on Amazon which gives you a huge savings versus buying ESPN Insider direct from ESPN. Don't waste your money buying ESPN Insider direct from ESPN. Buy ESPN the Magazine from Amazon and get ESPN Insider for free! Best of all, ESPN Insider comes at a huge discount when you buy via Amazon versus direct from ESPN. There is a second method which allows you to save money, scroll to the end of this article for details. Every ESPN Magazine Subscription includes ESPN Insider Access, for free! So you're using ESPN's Magazine discount on Amazon to save a lot of money on ESPN Insider!!! Pick Center: Stacked with stats and predictions from industry leading computer algorithms! Rumor Central: up to 25 updates per day on all the major sports. Special Incentive: Get ESPN Insider at a reduced price 25% off! Once your get your ESPN Magazine in the mail you can use it to get free access to ESPN Insider. Simply enter the 10-digit account number from your magazine mailing label here. Many people don't know this but ESPN Magazine Subscribers get ESPN Insider for free. I got my 10th ESPN Magazine in the mail Saturday, again I was completely stunned at the shear amount of content provided. I highly recommend having ESPN The Magazine shipped to you, for free with your subscription. Don't forget to use my coupon code link above and save $$$. Pick Center gives you all the statistics you need to make your picks. I use this to help me pick Fanduel and Draftkings team defenses and when deciding which QB/WR to stack in my GPP plays. It boils down to a savings of $10 to $30 off 1 year of ESPN Insider through my discount method. If you do not wish to get ESPN the magazine but are still looking for a way to save money on ESPN Insider I've got the answer. ESPN has a referral program which all ESPN Insiders have access to. Since I'am a ESPN Insider subscriber I can pass saving on to you with my referral link (AKA Coupon). You'll save the same amount of money as if you purchased ESPN the Magazine via Amazon. But remember, if you purchase ESPN Magazine via Amazon you get free access to ESPN Insider. Therefore, I really don't see a benefit in the referral coupon method. How did I find out about this deal? I purchased the 1 year ESPN subscription, afterwards I noticed within the members area on my ESPN Insider account that I can refer people to ESPN Insider. They get a $10 dollar discount (which happens to be the same price on Amazon). In return, the referrer receives a $10 dollar gift card for every person that signs via their coupon link. A couple weeks after I signed up I received my first ESPN Magazine via mail. The magazine contained great articles I otherwise would not have found and subsequently read online. The Magazine was packed with exceptional content, you got to tell them during sign up that you want to get the magazine via mail, which is included as part of your ESPN Insider subscription. But don't worry, you can also specify this after you signup within the Insider Members area. Claim your ESPN Coupon here, and enjoy ESPN Insider for free!